Blog Entry in DipNote: The official US State Department Blog Site: The true impact and power of a Department of State-supported USAID program in place there since 2007, evidenced in the form of a “for sale” sign. Given that backdrop, the last thing I expected to see on my recent trip to the Central African Republic (CAR) was the true impact and power of a Department of State-supported USAID program in place there since 2007, evidenced in the form of a “for sale” sign. Let me explain. 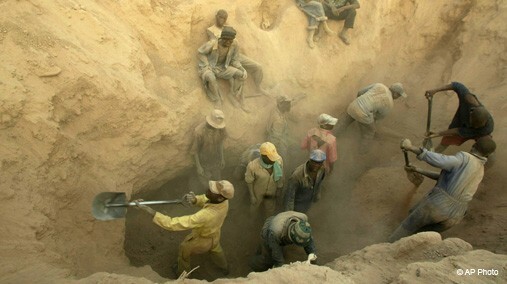 This program, called PRADD (Property Rights and Artisanal Diamond Development), focuses on clarifying and securing the land tenure/property rights of individual miners as a means of making artisanal mining a meaningful economic activity, independent of pernicious relationships with traders further up the chain. As a result, more diamonds are brought into the legal chain of custody, and miners’ livelihoods are secured and strengthened. To date, more than 2,000 mining claims in CAR have been mapped and publicly validated, and had property rights certificates delivered, through PRADD — meaning the CAR government recognizes miners’ property rights where none existed before. The impact of this reform-facilitating project in CAR is enormous, particularly in the power it gives back to the miners and local communities. In fact, PRADD has been so successful that the CAR government now plans to adopt and implement the program by itself. As such, it demonstrates the impact of the mission of the KP worldwide — to ensure that the entire rough diamond supply chain is formalized and accordingly “ring-fenced” so that conflict diamonds cannot penetrate the system. Now to the “for sale” sign. While driving through the remote village of Bossui in southwest CAR, I noted a sign posted by a local miner looking to sell or rent his mining site. While it may seem banal to us, this is almost revolutionary in an artisanal diamond mining area, since it is only possible because the rights to the site have been formally negotiated and boundaries demarcated with local community and government stakeholders. In addition to active mining sites like this one changing hands, mined-out sites are being sold so they can be used for alternative livelihood efforts (e.g., fish ponds and fruit orchards) that PRADD is facilitating. Previously, miners could much more easily have been evicted with no notice (often violently), and former mining sites could have rotted away as environmentally degraded areas with no economic potential; however, now real value is being created that goes directly to individuals and their communities. To me, this is the essence of what the KP and PRADD are all about. The KP’s primary requirement is that a country has “internal controls” to track diamonds from production to export. In too many places, however, this is not happening because socio-economic factors are not sufficient to allow a miner to sell into the formal system. But through a program like PRADD, which provides time and assistance to governments to strengthen their internal controls, and empowers vulnerable communities to become secure enough to buy and sell their mining rights, the KP can make a significant step towards eventually ending the trade in conflict diamonds — and possibly do much more. That is something we can all be proud to be a part of. Related Content: You can view photos from Special Advisor Brooks-Rubin’s trip to Central Africa Republic here.